The wisdom of Georgia O’Keeffe lives on through her many quotes, even though it has been twenty five years since she passed away. Georgia lived 98 years and was one of America’s most well loved artists. She was well known for her paintings of over sized flowers. Georgia thought the beauty of flowers should be noticed and decided to magnify them so as to compel people’s attention. Apparently her idea worked because after her first large-scale flower painting Petunia, No. 2, was first exhibited in 1925, her enlarged flower paintings attracted such attention that she profoundly impacted 20th century art and became the first woman to be honored with her own exhibition at New York’s Museum of Modern Art. 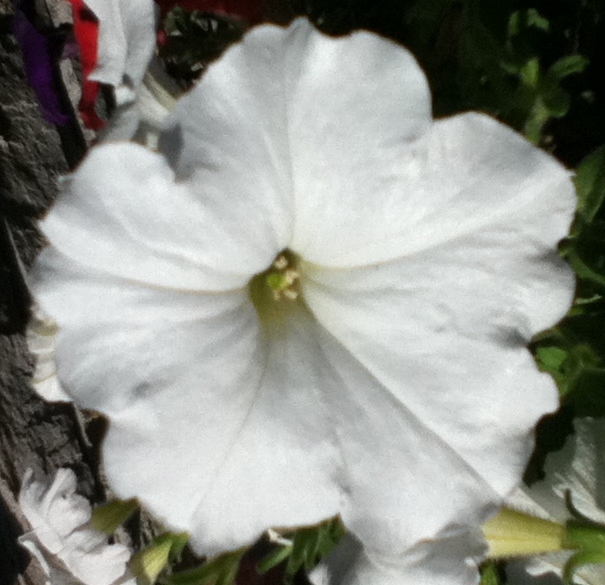 The Petunia is quite a common flower and perhaps that is why Georgia O’Keeffe chose to paint it as her first flower painting. Petunia’s have a quiet beauty all their own, however, being so common they are often passed by without notice, especially, I suppose, in a city as busy as New York where Georgia was living at the time. I can just imagine her one day stopping to look at a beautiful petunia growing in someone’s garden, and while enjoying it’s beauty, also feeling sad because no one else took the time to stop and enjoy it with her. Perhaps that is where she got the idea to paint a huge flower so as to command people to take notice. I was fortunate to have a dad who inspired me with his love of nature and life. I am not sure if he knew or had heard of Georgia O’Keeffe, but I do know he shared the same love of nature as she did, because his favorite saying was “Take time to stop and smell the flowers”. As he often did, so I also do, and it is my hope that you will too, not because a flower is magnified so much that you are compelled to take notice, but because it is a beautiful, wondrous work of God created for us to stop and enjoy. I would say Georgia O’Keeffe was quite an extraordinary work of God. Her beautiful paintings and insightful quotes live on to inspire people even today and cause me to wonder about my own life and what I am doing and saying that might be inspiring those around me. Words and works live on long after the people who said or did them are gone and it is my desire that mine would live on to inspire others and bring honor to God who created me.